There’s something to be said about a recipe that you can whip up in 10 minutes (15 if you, like me, are a slow nut chopper) with ingredients straight from the pantry. No trips to the store necessary. Viola, applesauce granola. I was reading this month’s issue of Real Simple tonight, and assumed that they would have holiday cookie recipes within its depths. Bon Appetit ALWAYS had cookie recipes in their December issues; or at least they did when I was subscribed to it for four years. Anyways, I just assumed that this trend would hold true for Real Simple, and I read the magazine from cover to cover. No cookies. Sigh. 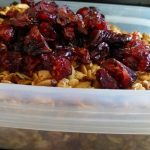 I flipped through the pages again to see if I missed the cookies when I came upon this applesauce granola recipe. It seemed super easy, in addition to the facts that I’ve had a jar of applesauce in the back of the refrigerator for months that needs consuming, and that I’ve been meaning to make granola for some time now (I’ve been saying that I should make granola for, oh, the last two years). So I got up from the couch, which is shocking enough on a cold, rainy day when all that gorgeous California weather disappears, and started making the granola. I made a couple of adjustments; I didn’t have any untoasted nuts besides walnuts, and I was afraid of burnt nuts (ouch), so I chopped a cup’s worth of walnuts. I used the white, unroasted sesame seeds, because I didn’t want the already toasted ones to get too dark. I sprinkled in copious amounts of ground ginger, along with cinnamon for good measure. I like my warming spices. After baking, I mixed in chopped dried apricots and cranberries. I also read the recipe wrong, and added about 1 cup of applesauce. How does 2/3 become 1? I originally plopped in 3/4 (hey, at least 2/3 and 3/4 are both fractions), but decided to add a bit more because I threw in some shelled pumpkin seeds I found. Whoops. It’s a good thing the consistency of granola doesn’t really matter or that granola doesn’t need to rise/complete a chemical reaction. 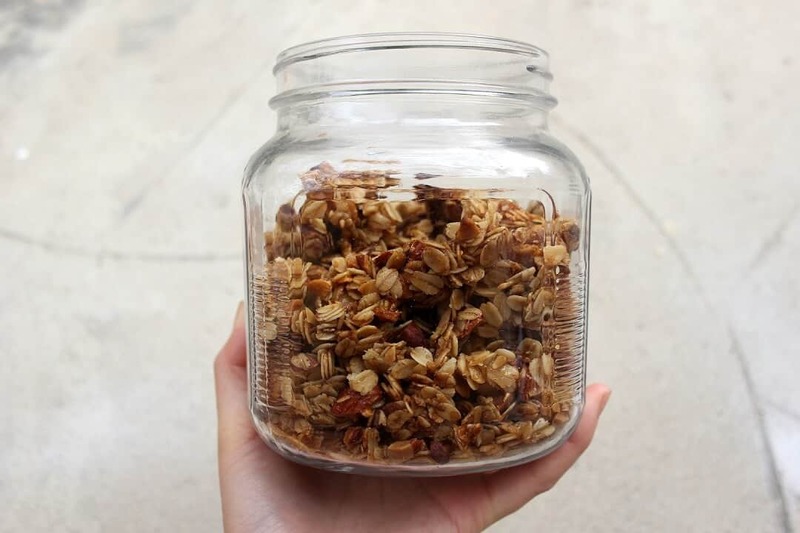 This brings me to another point: I love how easy-going granola is. Don’t have brown sugar? Use a mixture of molasses and granulated sugar, honey, maple syrup, or agave. No butter? Use canola or vegetable or coconut oil. 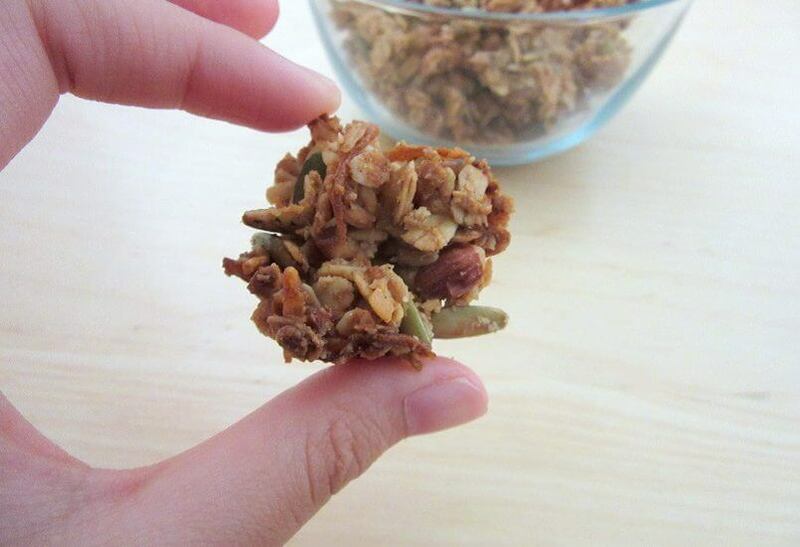 You can add any sort of mix-ins you’d like; I think coconut or sunflower seeds or almonds are delicious in granola. 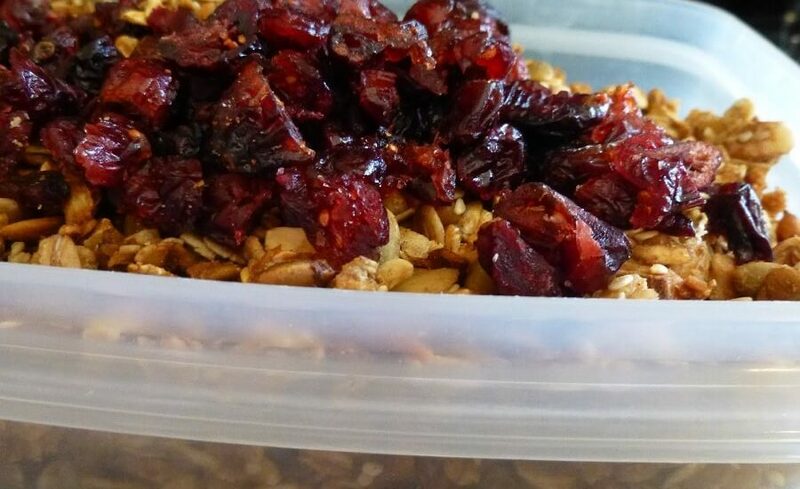 Granola’s flexibility makes it wonderful for the holidays. It’s fast and you can make it without a second thought. It’s yummy, but still wholesome, perfect for offsetting those morning buns and cinnamon rolls and custard french toast (my personal favorite) that you’ll be having. Alone, this applesauce granola isn’t very sweet. However, the addition of the dried fruit balances it perfectly. I’d suggest upping the sugar a bit if you plan on munching on this granola without chocolate or dried fruit or something sweet. One last thing: unless you want to babysit baking granola for 90 minutes, which I swear isn’t at all bad, you might want to up the oven temperature to, say, 300F. This applesauce granola uses applesauce to help bind the granola together. Combine everything but the fruit in a large bowl. Transfer to a baking sheet. Bake at 275F for 55-60 minutes, stirring occasionally, until golden brown. Mix in the dried fruit. From Charlyne Mattox via Real Simple, December 2013.